Select either the English or French version of the Know Your Zone application. The app remembers which language the user selected the next time they open the app. Language selection can also be made from the Menu screen. 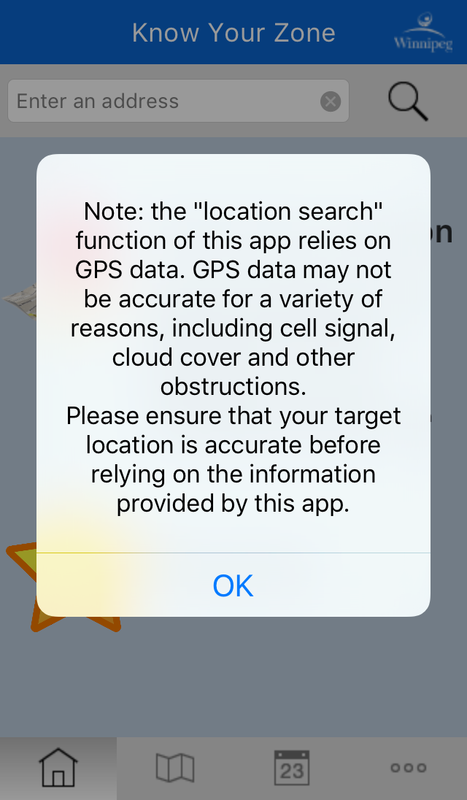 This notification advises the user to ensure the accuracy of their physical location, or the search address they enter, before relying on the data given by the app. 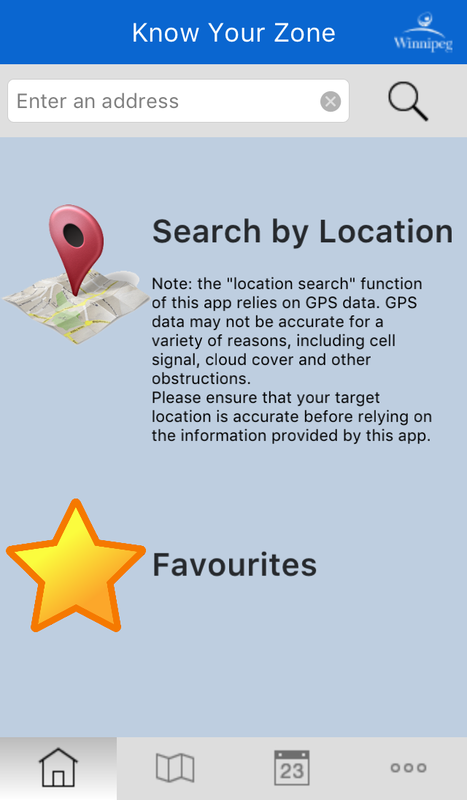 Select Search by Location to search using the current location as reported by your device. Select Favourites to view your saved favourite locations. Takes you back to the Home screen. Shows your location on a map. Displays the snow plowing schedule if a Residential Parking Ban has been declared. This schedule shows snow clearing on residential streets (street priority P3) only. Takes you to the menu screen with more options, and to change the language selection. 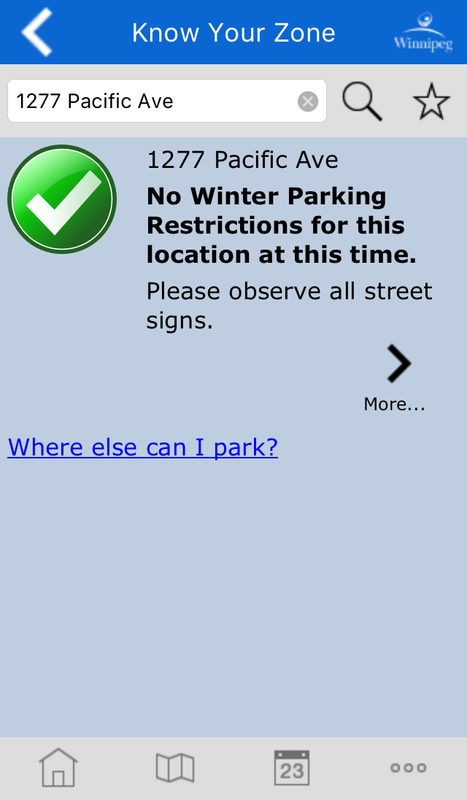 Selecting Search by Location shows a notice about the winter parking restrictions, if any, for the street section facing front of the searched location. 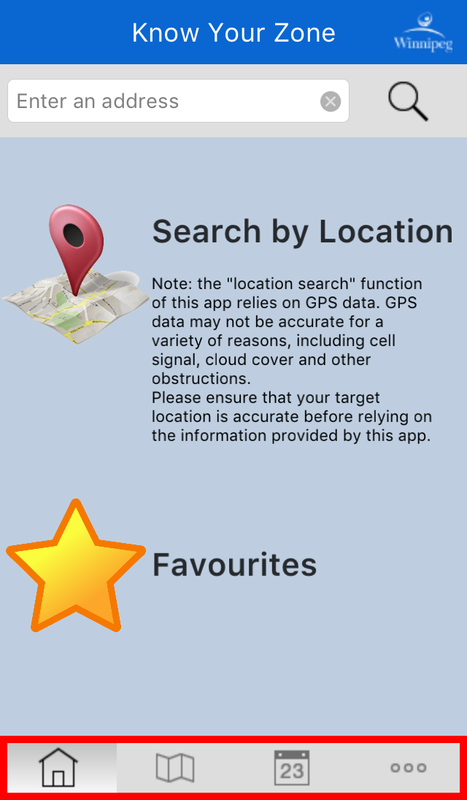 Select to save this location to your Favourites. Select More to show more details about the location. Where parking restrictions exist on adjoining streets, and other areas surrounding the searched location. Please always use the Where else can I park? option to view winter parking restrictions on the adjoining streets. Whether or not the location is on a Snow Route. Tap Back to go back to the previous screen. Tap any street on the map to view more information about that street, including any winter parking restrictions. layers Map Layers lets you select which additional information is displayed on the map. Takes you to your current location (if supported by your device). Takes you back to your searched address. 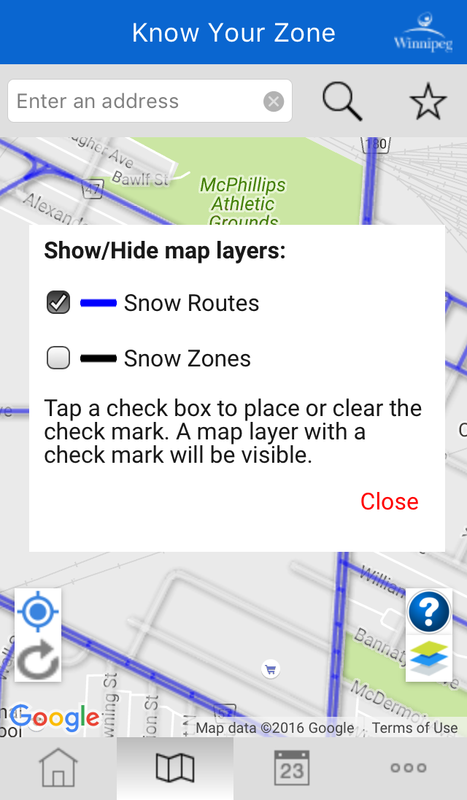 Show/Hide map layers will let you select whether Snow Routes and Snow Zone boundaries are shown on the map. You can select to view the Know Your Zone application in English or French. Select Current Parking Bans to show you whether there are any winter parking bans in place. Select Residential Park Ban FAQ to view a list of frequently asked questions. View Parking Ban Definitions to read about the 5 different winter parking bans that could be put into place to allow the clearing of snow on City streets. View an Informational Video about Know Your Zone. A checkmark indicates which bans are on/off. If a ban is ON the scheduled dates for that ban will be shown. If a Residential Parking Ban has been called, the scheduled dates will appear. Select to show the Residential Ban Schedule. The Snow Zone letters of the areas to be plowed. Current Shift where the residential parking ban is in place right now, appears in red. Next Shift appears in amber. Parking restrictions are shown for your favourites. Tap an address to see any upcoming parking restrictions. Slide left to delete a favourite. 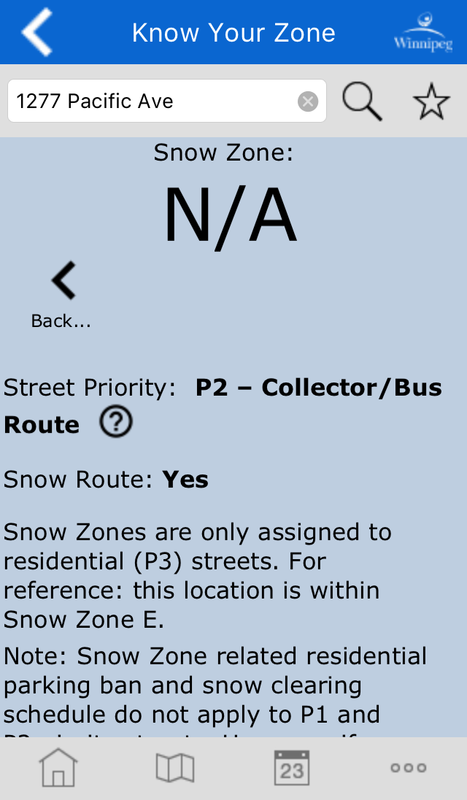 When a Residential Parking Ban is declared and one of your saved Favourite locations is scheduled to be plowed, you will receive a PUSH NOTIFICATION if you have it turned on in your device's Settings for the Know Your Zone application.